Has Attended the Midwest Clinic: The 2012 Clinic will be my 38th consecutive year of attending the Midwest Clinic. This is the one and only conference that I believe to be most beneficial for all band and orchestra directors. The featured ensembles set the standard for excellence and serve as a model for others to emulate. A Life in Music: Currently I serve as an adjunct professor, lecturer, clinician and guest conductor. I have presented sessions in 46 states, 5 Canadian Provinces and Australia. I am the author of The Creative Director Series, a co-author of the GIA Teaching Music Through Performance in Band series, and editor of the Edwin Franko Goldman March Series for Carl Fischer. I devoted my entire teaching and conducting career at the public school level. I have an extensive performance background in the early part of my career. 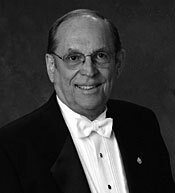 I was a clarinetist with the Syracuse Symphony Orchestra and played for most of the notable television and recording personalities from 1960-1995. Favorite Midwest Moments: My favorite moments and memories at the Midwest include serving as a guest conductor and presenting clinics dealing with rehearsal techniques and school reform issues. Of course, to serve as a member of the Midwest Clinic Board of Directors is truly a highlight in my career. Our Board members are dedicated to musical excellence and service to our profession. Hopes for Midwest Clinic Attendees: Young directors have the opportunities to hear the finest with bands and orchestras...they have the opportunity to speak with many notable clinicians, conductors, and performers. The unique opportunities available inspire young directors to achieve the highest levels of musicianship and teacher qualities.